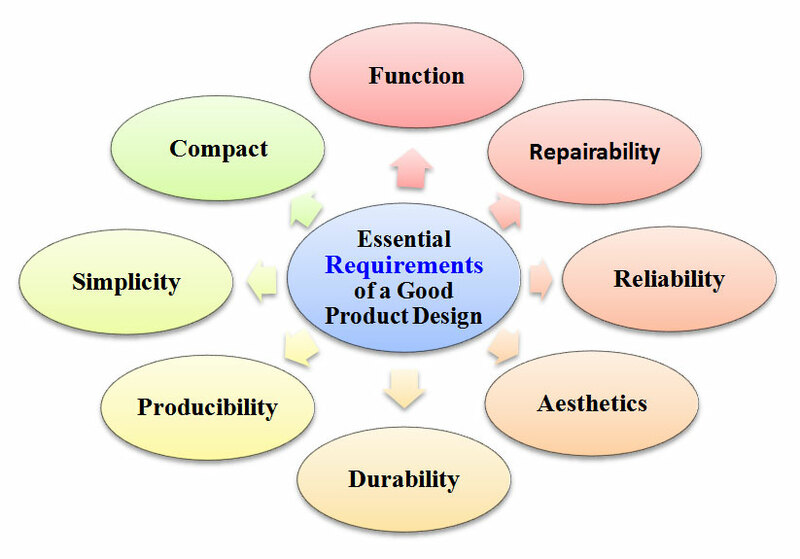 Main or essential requirements of a good product design are depicted below. Image Credits © Moon Rodriguez. Product must optimally perform its main function (task). It must be easy to repair at a low repair cost. It must be very reliable to use. It must follow principles of aesthetics. It must be a durable one. It can be easily produced in large numbers at minimum production cost. It must be simple to produce and use (handle). It must also be compact. Now let's discuss each essential requirement of a good product design. The product must be designed in such a way that it optimally performs the main task or function for which it is purchased by a buyer. In other words, the product must satisfy the needs and wants of the consumer. For e.g. The main function of an Air Conditioner (AC) is to provide quick cooling of a room. So, AC must be designed in such a way that it can cool a room as fast as technologically possible. If it doesn't meet basic expectations, the consumers won't buy it. The product must be designed in such a way that it can be easily repaired whenever necessary during a malfunction. The product repairs must be done quickly that too at a low repair cost. Consumers usually don't buy those costly products, which are either very expensive to repair / maintain or those who take a longer time and more money for repairing. Reliability means dependability on a product. Consumers prefer to purchase and use often those products which perform their main function or task optimally for a longer period without any annoying malfunctions, breakdowns or failures. In short, a product must perform quite well and give trouble-free service for a decent amount of time. It must not need constant repairs and/or frequent maintenances. It is so, since repairs often turn costly and are very time consuming. Reliability is crucial for consumer durables and office equipments. A reliable product gains consumers' trust, loyalty and this creates its goodwill in the competitive market. Therefore, reliability is an important factor to be kept in mind while designing a product. Aesthetics must be kept in mind while designing a product. It refers to, how the product looks, feels, sounds, tastes or smells. That is, the product must look, feel, sound, taste or smell very good. It must be attractive, compact and convenient to use. Its packaging must also be made graphically appealing and colorful. If this aspect is not considered, product will fail in the market. This factor is very important, especially in case a product is designed for and targeted to the young generation that is emerging with a modern mindset and current trends. Durability refers to the life of a product. A durable product performs flawlessly for a longer period. It is a sign of a good-quality product. Consumers want their products to have a longer life. They do not want to replace their products repeatedly. This factor is very crucial for durable and costly products like televisions, refrigerators, cars, so on. Therefore, durability is another important requirement that must be kept in mind while designing a product. The product must be designed in such a way that it can be produced in large quantities with ease at a minimum production cost. The production department must be able to produce the product easily, quickly, in ample quantities and at a low production cost. The production process must not be very complex, and it must not require costly machines to produce the product. The design of the product must be very simple. The simpler a design, the easier, it is to produce and use (handle). Simple products are also economical and reliable. The product must have the least number of operations without affecting its functionality. The product must be small; it must occupy less space, and must have lower weight. In other words, it must be very compact. The company must try to make its products as small as possible. Today, everything is turning smaller. Big sized cell phones are now out of fashion. In the 1950s, computers were as huge as spacious rooms. However, today we have laptops and palmtop computers. Most products can be made compact. Still, this cannot be done for all products. In case of televisions, it is just the opposite. Today people want bigger televisions. Similarly, there is a limit on small size. We cannot have a phone which is so tiny that it requires a microscope to see its keypad. Thank you so much, i really appreciate your work and effort. Thank you for providing articles (notes), which are helping me a lot. i have Passed my Exams just by reading your articles (obviously read according to my syllabus).